Canon Solutions America, Inc., a wholly owned subsidiary of Canon U.S.A., Inc., celebrates the recipients of the 2019 Coca-Cola Scholars Program scholarship. 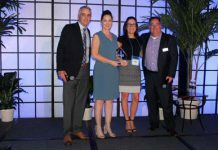 In addition to receiving $20,000 college scholarships, Coca-Cola Scholars traveled to Atlanta, Georgia, earlier this month for Scholars Weekend, where they served as the guests of honor at a celebratory banquet, which Canon Solutions America was proud to support. 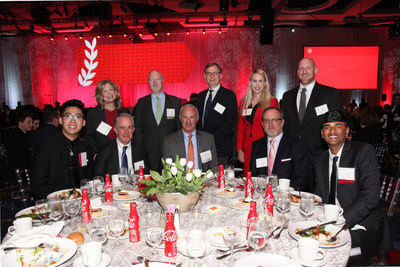 Pictured (L to R): Justin Thach, Coca-Cola Scholar; Karen Floto, Canon Solutions America; Barry N. Simpson, The Coca-Cola Company; John Reilly, Canon Solutions America; Douglas McClanahan, Canon Solutions America; Teoman Buyan, The Coca-Cola Company; Lindsey Bollinger, Coca-Cola United; Ron Wells, The Coca-Cola Company; Nathe Harris, The Coca-Cola Company; Praneeth Alla, Coca-Cola Scholar.